Mumbai attack mastermind Zaki-ur-Rehman Lakhvi, who has been remanded to police custody in an abduction case, on Wednesday challenged his detention on charges of kidnapping in a Pakistani court. "The first information report has (a) ghost character (abducted person) as well as carrying a concocted story to keep my client behind the bars," he said, alleging that the government had done so under India's pressure. Just before Lakhvi was to be released on Tuesday, he was arrested on charges of kidnapping a man named Muhammad Anwar Khan, an Afghan national. In an FIR registered on Monday at a police station in Islamabad, Anwar said he was kidnapped by Lakhvi six years ago. Lakhvi, 54, was granted bail on December 18 in the Mumbai attack case but was detained under the maintenance of public order. He challenged his detention under the MPO in the Islamabad high court which on Monday suspended the government order, evoking a strong reaction from India. 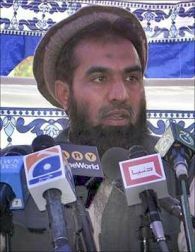 Lakhvi is being kept under high security at the Shalimar police station in Islamabad. He will be produced before the court on Thursday in the kidnapping case. A Pakistan interior ministry official told PTI that the police would seek his further physical remand. "The police will seek extension to his remand for at least one week," the official said. According to the FIR against Lakhvi, Khan went missing from Islamabad's Thallan Syedan suburb some six years ago. Khan's brother-in-law Muhammad Daud accused Lakhvi for being behind the kidnapping. "Anwar (Khan) would visit the Jamaat-ud-Dawah office in Bhara Kahu where the group motivated him about jihad and Lakhvi asked Anwar to get ready for it (jihad), but he refused. One day Lakhvi came along with his accomplices at his house and took Anwar with him," the FIR said. "Only after learning from television news that Lakhvi is going to be released, and thinking he may go underground, I requested the Islamabad police to take action against the accused for kidnapping Anwar," he said. Lakhvi and other six accused -- Abdul Wajid, Mazhar Iqbal, Hamad Amin Sadiq, Shahid Jameel Riaz, Jamil Ahmed and Younis Anjum -- have been charged with planning and executing the Mumbai attack that took place on November 26, 2008, and left 166 people dead. Kahan gaye woh achche din?